General Lee surrenders to General Grant. Today marks the 150th anniversary of the end of the most devastating war America has ever fought. On April 9, 1865, General Robert E. Lee signed the instrument of surrender at Appomattox Courthouse and General Ulysses S. Grant accepted the surrender. It was a moving moment for both men. 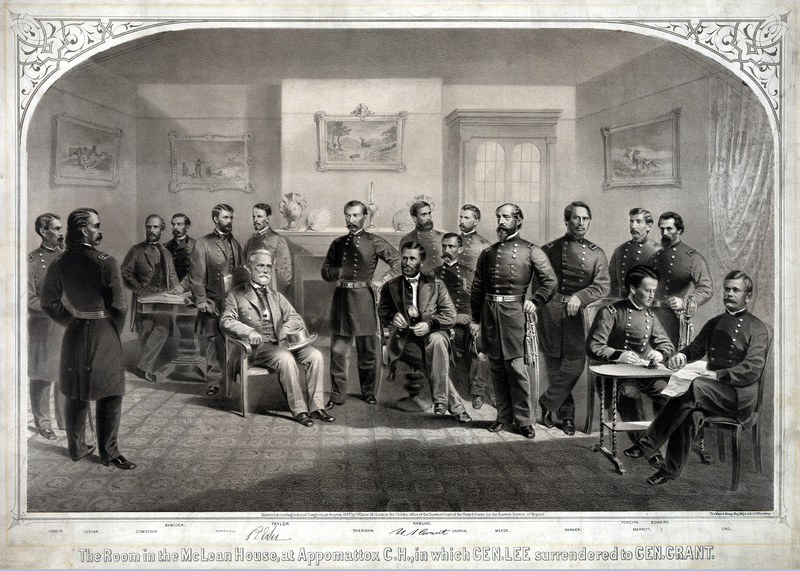 Today, a century and a half ago, General Grant pardoned all of the southern officers and troops and the long and horrible war was finally over. Americans called the war by many different names. Most commonly, people call it the Civil War. However, other names the populace used to speak of the war depended on whom you’re talking with. People from up north referred to the war as The Civil War to Preserve the Union. A person from the south more than likely will call it The War of Northern Aggression, or The War Between the States. Some also called the war Mr. Lincoln’s War. No matter the name applied to this war, it was a very dark period in our history. Because the North won, they were privileged with writing the history books. That is the way it is in all wars. The victor is always able to tell the tale their way. Consequently, the North slanted much of the truth about the war to their perspective. Sometimes, the perspectives aren’t always so truthful. They (the northerners) said slavery was the reason for the war. That was only one issue. Another was states’ rights. Somehow, the writers of many history books forgot that fact. The North came down and invaded the Southern States, causing them to split off from the Union. The question begs asking – if someone were to invade your home, would you not fight to protect it? Home invasions are what happened in the South in April of 1861. The majority of the southerners did not own slaves. They were dirt-poor farmers only trying to eke out a living from the land. They were content with what they were doing, they were happy in their family lives, they believed in their little towns and their churches and their God. Most in the South only wanted the North to leave them alone. The North did not leave the South alone, however, and what ensued was four years of of war that took the lives of more than 620,000 Americans. The Union suffered 110,000 combat deaths and another quarter million to other causes while in service during the war. The Confederate States of America lost 95,000 southern boys in action and another 165,000 to non-combat related causes. Many in America still talk about how terrible and wrong we were in fighting the Vietnam War. They lament the loss of more than 52,000 of our military during the nine years the United States actively fought in that war. In the three days of fighting at Gettysburg from July 1 to July 3, 1863, more than 51,000 boys on both sides fell – in three days. After the battle was over and General Lee began his retreat, the wagons comprising the crude ambulances of the time stretched along the route west for more than 14 miles carrying the non-ambulatory wounded. My great-great grandfather fought at Gettysburg. He was later one of only nine Confederate soldiers lost in the woods and captured at the battle of the Wilderness. 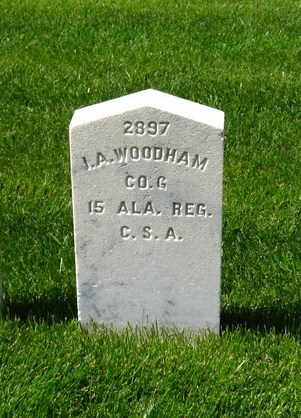 After his capture, the Union Army sent John Alexander Woodham to the prison at Elmira, New York. He left his home and a pregnant wife in August 1862 to join Company G of the 15th Alabama Infantry. He left his family to protect his home from northern invaders. He owned no slaves; he merely wanted to be a farmer raising kids and crops on his land to feed those kids. As it turned out there were no more children. John Alexander Woodham never met his son, my great-grandfather, John Webster Woodham. John Alexander became gravely ill as a prisoner at Elmira and was bedridden at the time the war ended. He survived beyond the surrender at Appomattox and lived on until June 1865. On the 4th day of June, John Alexander passed away lying in the bunk he had not left since falling ill. After his death, the officials at the prison camp buried him at the Woodlawn Cemetery. Later, another (more famous) relative would find an eternal resting place not far from my great-great-grandfather. This entry was posted in History, Life in General, Personal and tagged 150th anniversary, Appomattox Courthouse, April 12 1865, April 9 1865, combat deaths, Company G 15th Alabama Infantry, General Robert E. Lee, General Ulysses S. Grant, Gettysburg, John Alexander Woodham, Mr. Lincoln's War, non-combat deaths, Southerners, states' rights, the Civil War, The Civil War to Preserve the Union, the North, the prison at Elmira New York, The South, the War Between the States, The War of Northern Aggression, Vietnam. Bookmark the permalink.